First of all, I apologise for the lateness in this review. There is a life outside of this screen, and it is getting messy and busier by the day. Still, duties are duties, and I thank you for not giving me flak for dropping this a week later. 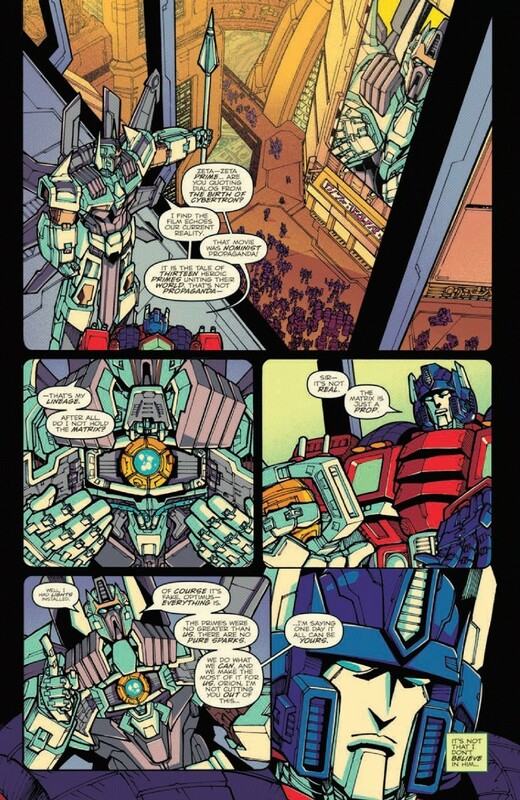 And I hope you picked it up, because there is plenty to talk about in this third issue of Optimus Prime. 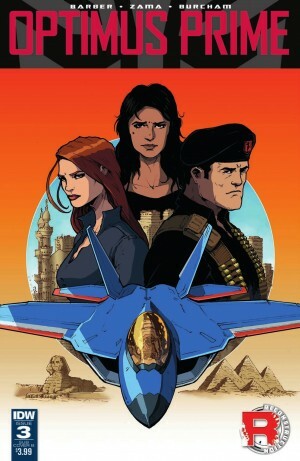 We reach the third issue, the central one in the first arc of this new book at the hands of John 'Continuity' Barber, and we check-in almost directly with Thundercracker's work-away-from-work as deals start taking place with The Crown Jewel of The IDW Universe - apparently - and some more backstories get filled in, via Marissa Faireborn. 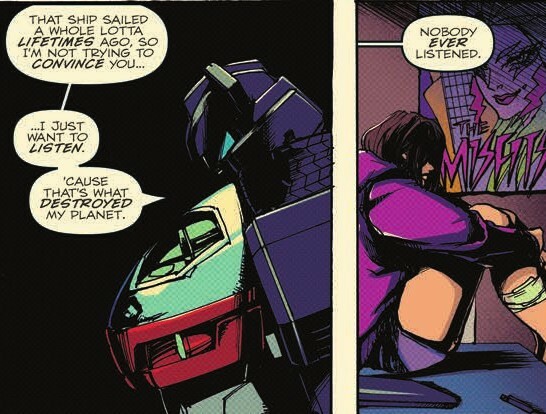 The other major storylines, however, are even more intriguing, with Soundwave's inner monologue proving the caption commentaries this issue, as we dive back into his first encounter with Orion Pax, as they were very much (but maybe not) on the opposite sides of the beginning of history - compared to where they both are now. For however long. That, while taking the current plot forward as well, as we find out what happened to Cosmos, the cassette-birds, and the whole idea of the Decepticon commune in spaaaace, in Barber's probing of the Junkions' intentions on Earth. Plus. 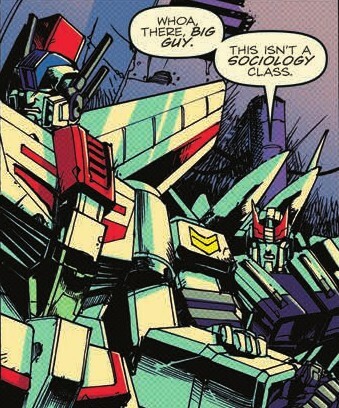 in much better characterisation that previous works by the same author - we re-visit Jazz' character concept of understanding Earth culture, Jetfire's early motives, Prowl's Prowlness - and lots and lots of Thundercracker. I really do like Kei Zama's work, if that hadn't been clear in the previous posts about this series, and I believe we get to see a different side of her art in this issue: more humans, more organic cast, more humour to work with alongside the political intrigue of both past and present. And I'm satisfied we what we find - though there is always a touch of the sinister in the inks. You want a darker tone to your stories? You want police/cop drama set in the past? You want political intrigue and chess-playing in the past and the present? Get Josh Burcham to add colours to Zama's linework: it plays with the heavy inks beautifully, it doesn't sacrifice diversity in the palette, and it delivers a great looking book. 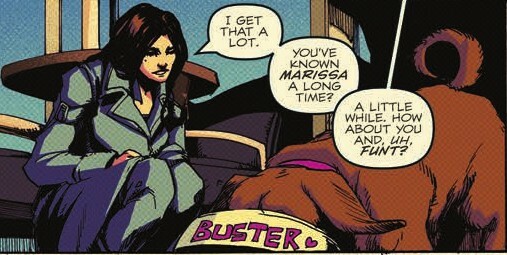 Likewise, the lettering is an incredibly nice touch on top of what the art and dialogue already carry, as Tom B. Long's caption are never intrusive but still always there for new and old readers alike (the added snark in them is a bonus). 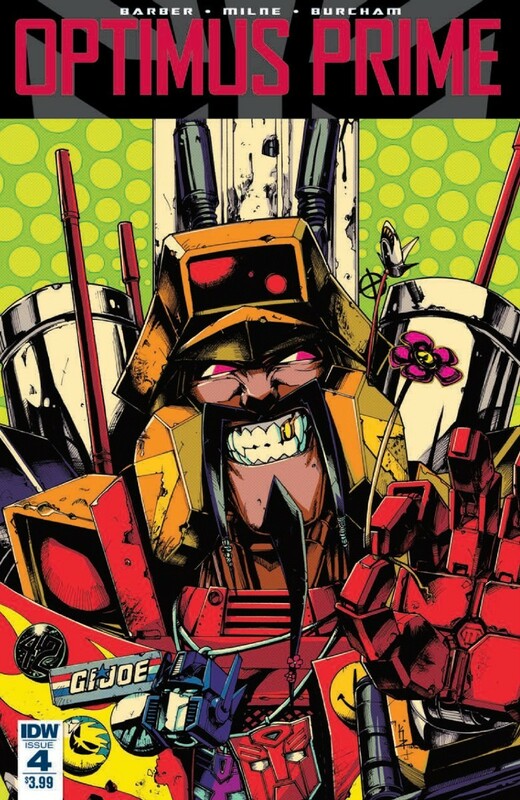 The covers are a full IDW TF roster too, with Zama and Burcham on main, but Andrew Griffith and Josh Perez (thumbnail), Joana Lafuente, and Casey Coller all deliver some truly exquisite variants. 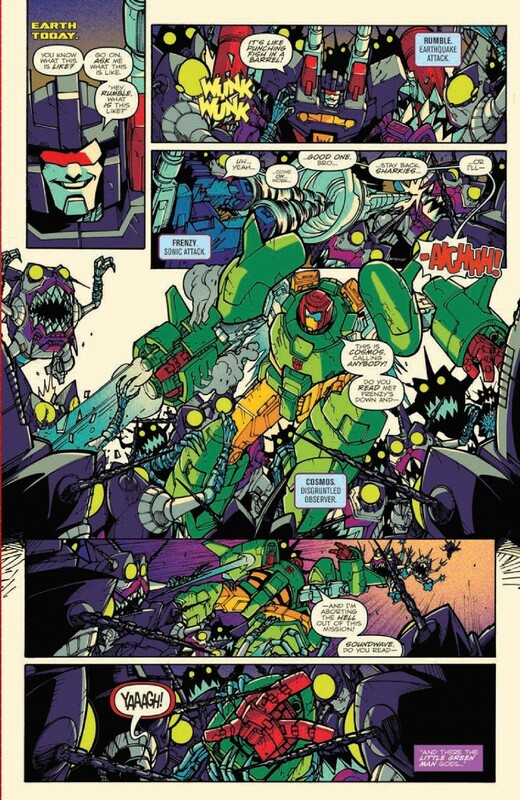 There is plenty of humour too, as we see some of Barber's early RID work shine back through, and we get a very good look at Zama's style all round, as more organics, more beastformers, more humans, more facial expressions join the cast and the fray for the issue. As I said, the speed of the plot may have taken a slight slower route, but there is plenty to enjoy nonetheless. 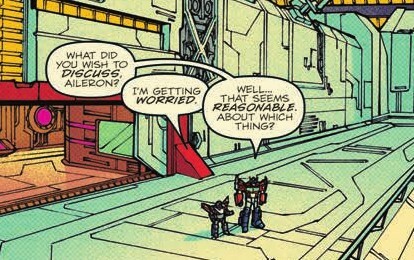 I love johns writing and have always favored RID/TF/OP over MTMTE/LL but I can't help but feel it hasn't gotten to the point that it did with season One of RID. Maybe it's because that was such breath of fresh air in the comics in 2012 or maybe it's just me. Anyone else feel that way? 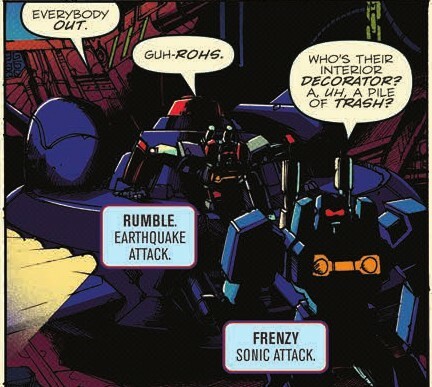 I really love the Soundwave, the Jetfire, and the Jazz in the current story. Those 3 really stand out to me. 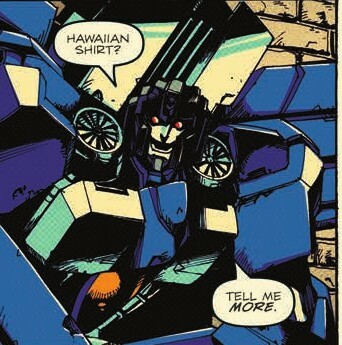 Randomhero wrote: I love johns writing and have always favored RID/TF/OP over MTMTE/LL but I can't help but feel it hasn't gotten to the point that it did with season One of RID. Maybe it's because that was such breath of fresh air in the comics in 2012 or maybe it's just me. Anyone else feel that way? As I kinda touched upon in the review, I feel like we're very much back there, with some more humour and some even better characterisation. He's working with new characters, or ones that haven't had much about them yet, rather than your usual core crew (plus Metalhawk) - and I like it! What stands out to you as being not as good as RID? D-Maximus_Prime wrote: I really love the Soundwave, the Jetfire, and the Jazz in the current story. Those 3 really stand out to me. Our final preview for tonight fresh from iTunes is for IDW Optimus Prime #4! #4 starts off with a hoard of Sharkticons, some Junkions, and some more Zeta Prime/Orion Pax business from about 4 million years ago. Give it a look, and let us know what you think in the comments section below! The Transformer sized human in knight armor on the right. aw mann... Milne must be a guest artists on all books man. 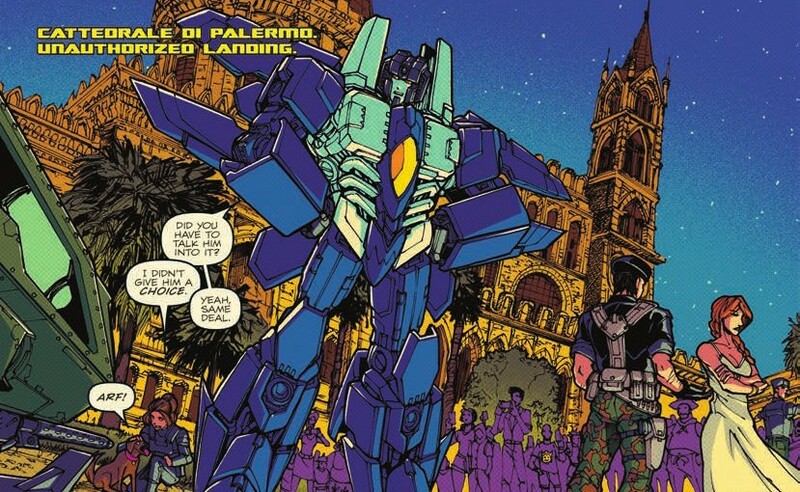 Really epic representation for any TF graphic novel/comics. 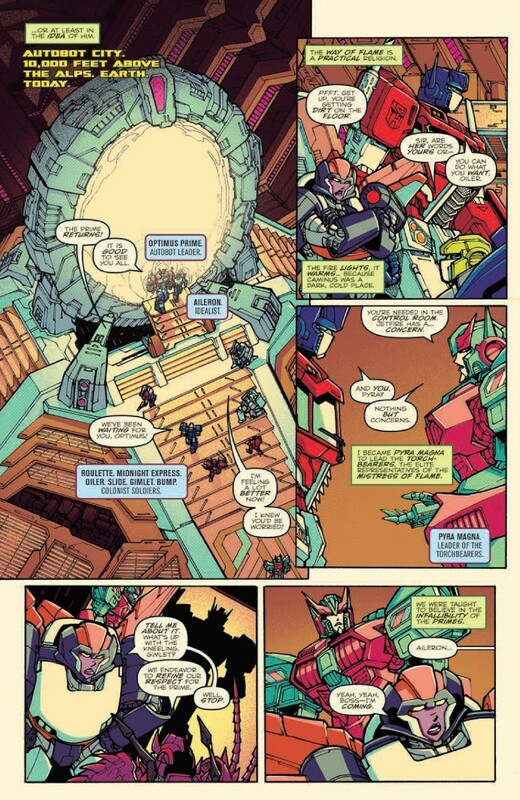 ^ I love Milne's work to pieces, but Sara Pitre-Durocher is doing so darn well on TAAO that I'm not fussed if she draws the book for every issue ever. 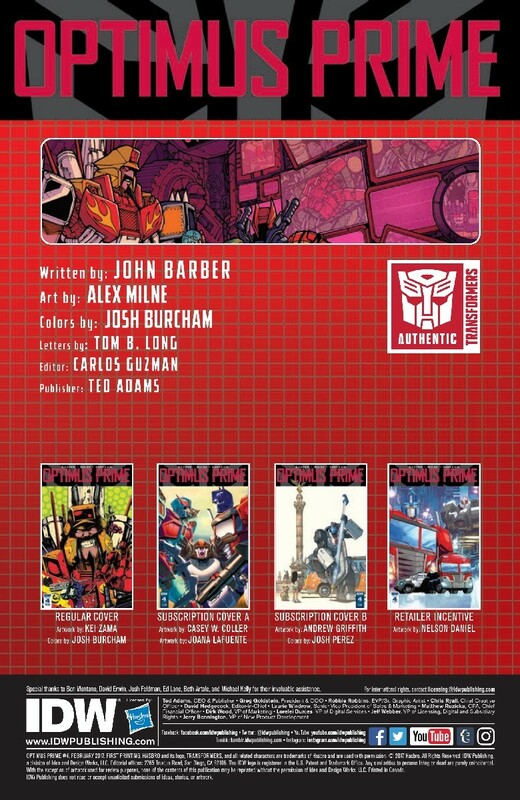 Also via comics news site Newsarama, we have a full preview for the other Transformers book from IDW out next Wednesday - Optimus Prime #4, guest starring Alex Milne on interior art! Check it out below, and head back next week for a review, plus the discussion in the Energon Pub. - Variant cover by Nelson Daniel! Looks great! I love the take on Zama's style. It's a little clearer than hers, but still very distinctive. Seems like we'll be getting a little more backstory for Pyra Magna, which is great. I hope she isn't the only Torchbearer who gets any characterization, though. There's still Dustup's secret that Jumpstream found out during Victorion's first formation. My only nitpick is that every single bot has to be identified with a caption, while whomever is narrating also has their internal dialogue going on. It's at its overkilliest (yes, I made that up) when Pyra Magna narrates why she became the Torchbearers' leader..... when the caption right next to her repeats the same thing. I'm enjoying this new book tremendously. It may actually be my favorite of the ongoings at this point in time! 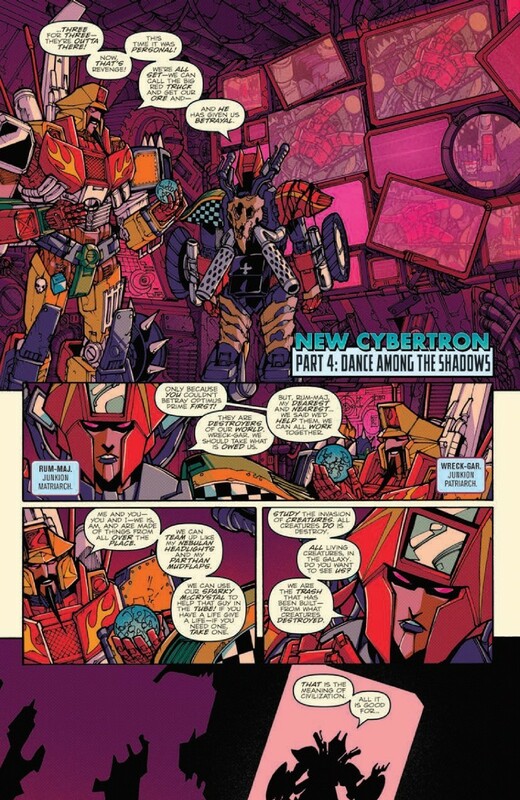 We return to Earth, which has Cybertronians and Junkions on two sides of an agreement which may not be, as humans reluctantly also maybe agree to disagree, while two leaders very much disagree as other two leaders disagreed in the past. 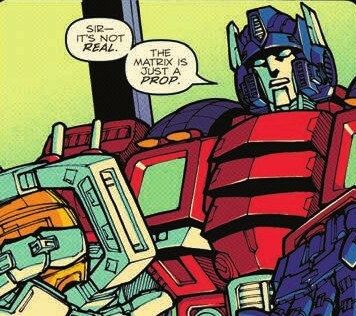 We return to John Barber's vision of the new order of the things - Optimus Prime #4 is here! Let's get this out of the way: Optimus is reaching peak Prowl. 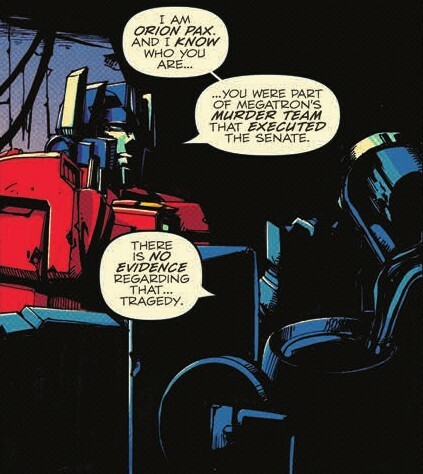 There are a number of moments where this is obvious, and I can't but think of this being a consequence of Combiner Wars (still) and his moment so close to the Autobot's master manipulator - other than being around him for pretty much the entirety of his life as an Autobot himself, of course. It's good, it's very good to see some development of Pyra Magna's character, as all of the Torchbearers were teased as having secrets and intrigues which we are still waiting pay-off for. But having that development also be pitted against Optimus is a super extra treat. Two very strong leaders with strong ideals, in their own way, against each other for very similar causes, at not the best time, but also maybe the best time too. The rest of the story is a very good exercise in build-up, I felt, too, with a subtle increase on the pressure valve (up to the final act, where subtlety is chucked out the window) - but also a very welcome distraction in the form on Thundercracker and Buster, and a lot more about Marissa Fairborne in just a couple of pages. 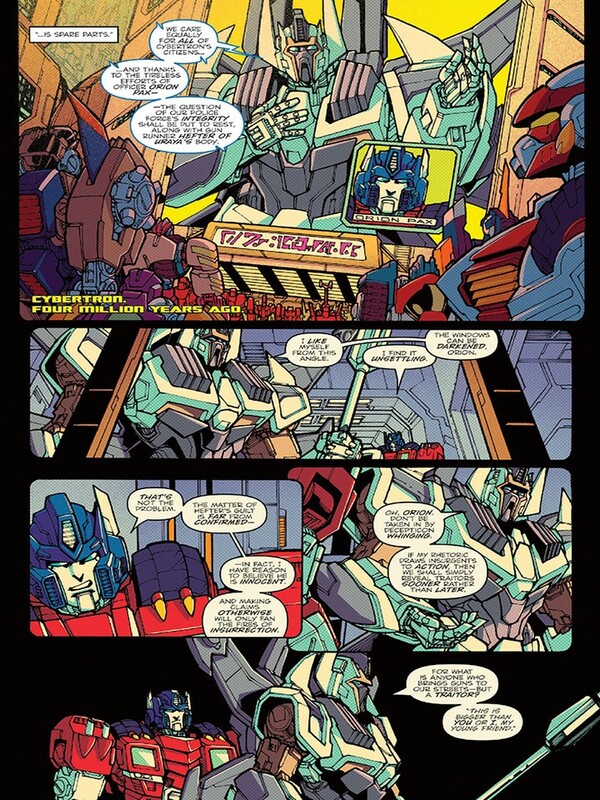 We knew of Alex Milne's subbing in for Kei Zama in this issue, and it's very good to see him back on a TF book interiors, even halfway through an arc. He keeps to the style that makes him beloved to the fandom and readership, while also thickening some inks, and adding a lot of black, black spaces for added tension, emotion, and pacing. 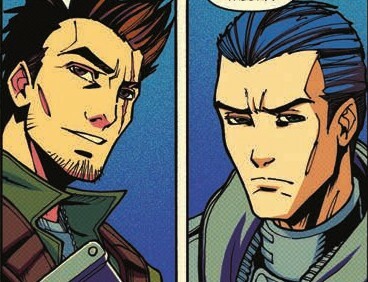 What is truly extraordinary on the art side of things, though, is the combination of Milne's lines with Josh Burcham's continuity colouring, keeping the transition between the two artists as smooth as possible for the book (the blue shading really does help), without sacrificing the differences of the two styles. It's a feat he achieves perfectly, I feel, and really helps the issue. The devices used in the script to carry along the narration require skill from the lettering side of the book, once more in the capable hands of Tom B. Long, who is also still painstakingly bringing us mini-bios for each character as we read through - and somehow manages to never make it intrusive. 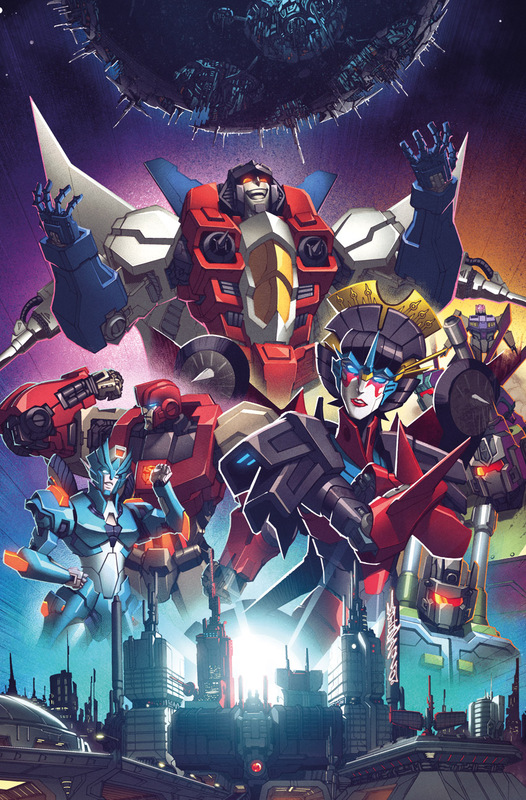 There is a full roster of TF veterans in the cover roll, and you can see all of them and full credits in our database entry here, from Zama to Griffith, with Nelson Daniel, Casey Coller, Joana Lafuente (thumbnailed), Burcham and Josh Perez fully acknowledged too. 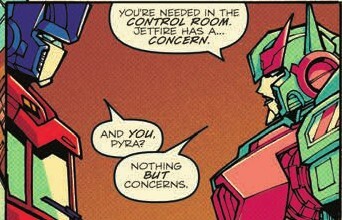 Having Pyra Magna as the point of view for the running commentary on the issue is a great way of bringing in her voice on top of the placing against Optimus' leadership, and a welcome addition to that of Arcee, and Soundwave so far - and using the parallel threads of the past (the panels mirroring Zeta and Optimus are exquisite and very revealing) alongside the multiple storylines in the present and her personal beliefs, works out as a very revealing and definitely enticing, plot movement and pacing. The reintroduction of a different, but established, visual team does not disrupt the book at all, and the whole issue comes across as perhaps a seminal one in the aftermath of whatever may happen with the Junkions in the arc - will Pyra Magna get something more than she expects? How will the colonists react? What role will Aileron play? Great issue, but I have to disagree about the lettering slightly. The mini-bios are rather intrusive, because they happen every single issue. Add that to the narration boxes and speech bubbles and it looks slightly cluttered. Pyra Magna's little mini bio says the EXACT SAME THING that her narration does right next to it. Clutter. There's no need to recap who everyone is Every. Single. Time. Bounti76 wrote: Great issue, but I have to disagree about the lettering slightly. The mini-bios are rather intrusive, because they happen every single issue. Add that to the narration boxes and speech bubbles and it looks slightly cluttered. Pyra Magna's little mini bio says the EXACT SAME THING that her narration does right next to it. Clutter. There's no need to recap who everyone is Every. Single. Time. I can see your point, for sure, but I'm also coming at the comic from this perspective: This is the book that non-TF readers have been told to go read after Revolution. Those captions are for them, not us. And for what they do, I don't find them that much in the way (and I love the comments in some of them, too). True, some of the comments are amusing, I agree. And it makes sense why the captions, I just hope it won't be a permanent thing. They should fade out, hopefully, yes! Cool! Torchbearer characterization. Wonder what Dustup's little secret is. I really wish I gave a damn about this while Optimus/Pyra/Matrix thing. Originally I did but with Primal winning the contest I don't really care anymore and it's due to we know her and Victorion won't take the Matrix. Now I'm just asking "well how is that going to work?" Two characters named Optimus, both will have the title of Prime and the matrix is broken. 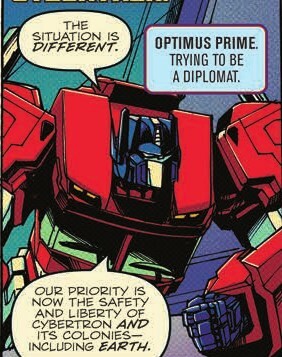 Obviously IDW is going to do their own thing and base the story as loose as possible with the toy line like Combiner Wars and Titans Return but the fan vote stuff is included regardless. I'm sure Carlos, John, and Margaret are all sitting down saying "alright how the hell do we out this together?" Alright, so hear me out. First, this is my favorite comic right now. I am loving this book. Also, Damn I hated Optimus towards the end. You outright said you are just using people who worship you even though you acknowledge frequently you are not. I want something from that combining experience to show up again, so that way it makes more explicit sense Prowl has infected him,the same way I wish the other bots force to combine would show up to show the side effects of that. 5,431 pages were recently viewed by 1,053 unique visitors. This page was viewed 1 times on Sunday, April 21st 2019 11:56am CDT. © 2019 Seibertron, Inc. DBA Seibertron.com. All Rights Reserved. Established June 2000. Seibertron.com is owned by Ryan Yzquierdo.